Firstly see our page on the advantage of a dedicated EV charging point here. Reducing the environmental impact of greenhouse gas emissions in Britain is becoming a very important factor in today’s society. R.B. Grant are helping to develop and increase the amount of renewable energy and reduce the energy consumption throughout Scotland. The most important challenge in the transport industry is to reduce carbon emissions and petrol utilisation as it is not a renewable energy and so becomes a more expensive source of fuel. It is very important to find other solutions to help the carbon footprint. The electric vehicle is a perfect solution due to the zero emissions and it is also a sustainable renewable energy. R.B. Grant are fully qualified installers of Elektromotive charging points. 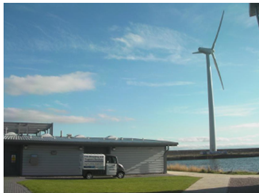 One of our most recent projects was in Methil installing an EV charging point. The project at the Hydrogen Office was done to show the importance of renewable energies, energy efficiency and the use of hydrogen to reduce environmental impact. The Hydrogen Office is a building receiving power from a hydrogen source. The power system also includes a 750kw wind turbine, an electrolyser and a geo-thermal source heat pump. The project demonstrates to the community an example of construction using energy in one of the most efficient manners, by only using renewable energies and being carbon negative. The project includes an EV charging point for a special wind-powered electric van. The electricity received by the EV charger is from the wind turbine, which then powers the vehicle. With a charging point installed, the community can have a transport system running on renewable electricity with zero carbon emissions throughout the process (during the electricity production and when the van is in use). R.B. Grant have contributed to many electrical installations at the Hydrogen Office. R.B. Grant installed LED lights which require low energy to work. We have also helped with the construction of the hydrogen cell and installed the charging point for the electric vehicles. R.B. Grant have installed two charging points for a fire station and fireman training center in Inverness. They required EV charging points for their electric vehicles. They installed a circuit with an appropriate circuit breaker, an earth point for protection of the charging point and a pull cable between the board and the EV charging equipment. Axeon required EV charging points for their electric vehicles. R.B. Grant supplied and installed an Elektromotive 32 amp 7 kilowatt dual 240 volt outlet with 61296-2 socket and mode-3 controller. Installation included RFID meter and GSM / GPRS modem. R.B. Grant are fully trained installers for Elektromotive to install their domestic and commercial charging points all over Scotland. Please see our Elektromotive EV Charging Point Installation page. If you are interested in EV charging points and would like further information regarding a full installation for your home or business, please contact R.B. Grant Electrical Contractors.